Over the past ten years, I have had the honor of collaborating with my beloved colleague, Christine Valters Paintner, and helping her create and develop Abbey of the Arts, a global online monastery fostering contemplative and creative expression. What an exciting adventure it has been to see Abbey of the Arts become a vibrant far-reaching soul-community through the gifts of online connection and outreach. And along the way, Christine and I have become such steadfast and playful friends! It all started when she and I came together in 2005 to teach Awakening the Creative Spirit, an experiential course designed for spiritual directors to learn how to integrate the Expressive Arts into their practice. As we shaped the material, we discovered a deep longing for all kinds of folks in soul care ministries to claim the arts as a form of prayer, contemplation and ministry. So eventually, we wrote a book out of our experience, (commissioned by Spiritual Directors International) which is now used as a textbook in spiritual direction programs across the country: Awakening the Creative Spirit: Bringing the Arts to Spiritual Direction. Alongside our teaching together, Christine ventured into the world of the virtual online classroom and – low and behold – discovered her classes and retreats were meeting a huge need across the globe! Together, folks could find support for integrating the depth of Christian practices with emergent awareness, consciousness and creativity. Having a PhD in Christian Spirituality and being a Benedictine Oblate, Christine wove into her offerings a deep connection to monastic practices. Eventually, she felt called to develop and foster an ongoing community of creative spiritual practitioners – and what better form than an Abbey? As Online Abbess, Christine launched the Abbey of the Arts, named the community The Holy Disorder of Dancing Monks, and wrote a Monk Manifesto to clarify the commitment to creative, contemplative and compassionate practices that community members can sign and follow. I am honored to be a member of the Abbey Wisdom Council, and an ongoing collaborator. 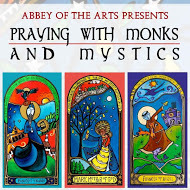 By following the links below, you can read more about the Abbey of the Arts and consider joining us in the Holy Disorder of Dancing Monks! I have had the honor of creating movement prayer material (on video) for numerous online retreats, and many of them are available as self-study. This way, while on retreat, you can explore the gift of dance as a contemplative and expressive modality without leaving the comfort of your home. Click here to view available retreats and consider signing up for one to be supported in your journey of faith and discovery. Are you a soul-care practitioner? Chaplain, counselor, minister, spiritual director or other helping professional? Under the auspices of the Abbey of the Arts, consider joining me in Scotland or in the Pacific Northwest for one of our upcoming Awakening the Creative Spirit Retreats for Soul Care Practitioners. We’d love to have you join us! Hildegard of Bingen is one of my most beloved spiritual mentors. An absolutely amazing woman of mysticism, faith, artistry, leadership and healing, Hildegard is being rediscovered as mentor for our time. Christine Valters Paintner and I will lead a small group of pilgrims to walk in the footsteps of Hildegard of Bingen in her homeland of Germany. Join us in Germany! I am very excited about the Abbey’s newest publication, a triplet of Book, CD and DVD celebrating Monks and Mystics! These materials were commissioned by Abbey of the Arts and produced by The Dancing Word. A wonderful collaboration of spirit and play! The story: Christine chose a group of 12 Monks and Mystics from throughout the ages to be a group of saints and mentors (almost an ancestral wisdom council) for the Abbey. Then she commissioned a beautiful icon for each Monk or Mystic by the whimsical artist Marcy Hall. Each icon depicts the monk or mystic dancing! So, it seemed to me that the obvious next step was to commission a song and dance to invoke and embody the charism of each of these dancing Mystics! Thus, our latest project was born. The dancing monks and mystics include (among others) the Prophet Miriam, King David, Mary Mother of God, Brigid of Kildare, Benedict of Nursia, Francis of Assisi, Thomas Merton and Dorothy Day. The DVD features a welcome/introduction plus twelve prayerful and playful participatory dances for every-body! Each dance includes an instructional video and a dance along video so that you can learn and partake with ease. We filmed each dance filmed in locations that evoke and celebrate the gift of each monk and mystic, so that even if you prefer to simply watch, the dances are visual mediations in themselves. Locations include the Holy Well of Kildare, Ireland; Cong Abbey in County Mayo, Ireland; St. James Cathedral, Seattle; the streets of Tacoma, WA, etc. The original book Praying with Monks and Mystics has now been superseded by Christine’s expanded offering entitled Illuminating the Way: Embracing the Wisdom of Monks and Mystics which includes a beautiful evocative poem for each Monk or Mystic written by Christine, along with full-color plates of the icons and an exploration of the archetype of each character. In addition, the songs are available on the CD Singing with Monks and Mystics or as downloadable mp3s. 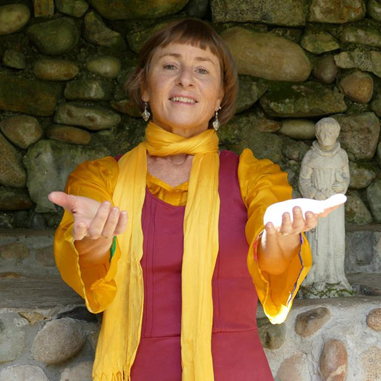 A full range of expressive arts to engage the monk or mystic within you! Praise for Dancing with Monks and Mystics – “This is what we need! The Abbey of the Arts is offering us a ‘moving monastery’ yet with solid grounding in Scripture, Nature, art, the Tradition, and the Saints.” – Fr. Richard Rohr, O.F.M. Read a Blog Post from David Ash about writing music for the Abbey!